When figuring out our activities for the day we decided to check out Montjuïc Fountain. 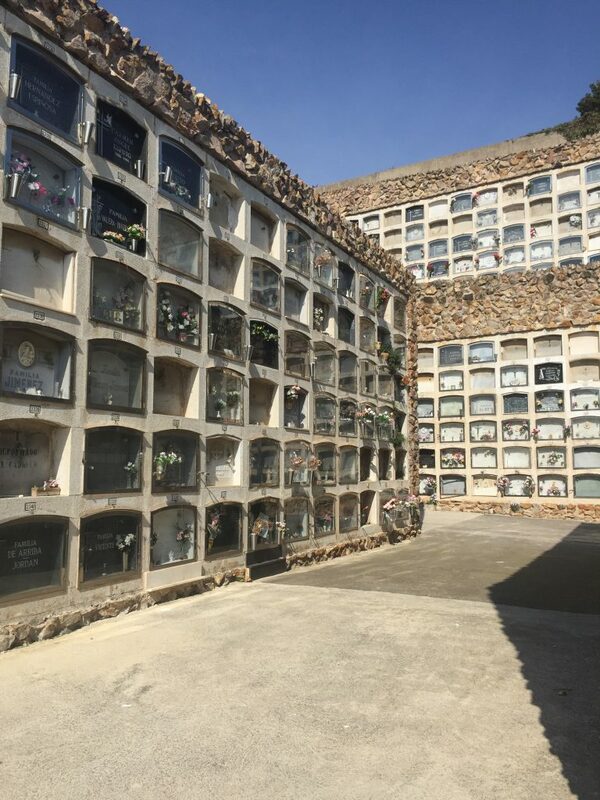 When looking on Google Maps I noticed that it seemed quite close to Montjuïc Cemetary. After a quick google search which showed beautiful sculptures at the cemetery we decided to combine the fountain with a side trip to the cemetery. Our day soon turned comical as we tried to navigate our way over the hill from the fountain, through the eerily abandoned Olympic village, and then up a hill that at one time must have been beautifully manicured but now lays in neglect with overgrown pathways and dead ends. My advice to you is to come to the cemetery from the front side instead of the back. If you come from the back, like we did, you may be greeted with a slightly eery feeling of being in an abandoned area where the locals don’t seem to venture. Indeed, we were beginning to wonder if we had stepped into the twilight zone! From a distance, we thought that the top of Montjuïc Hill was filled with old apartment buildings. 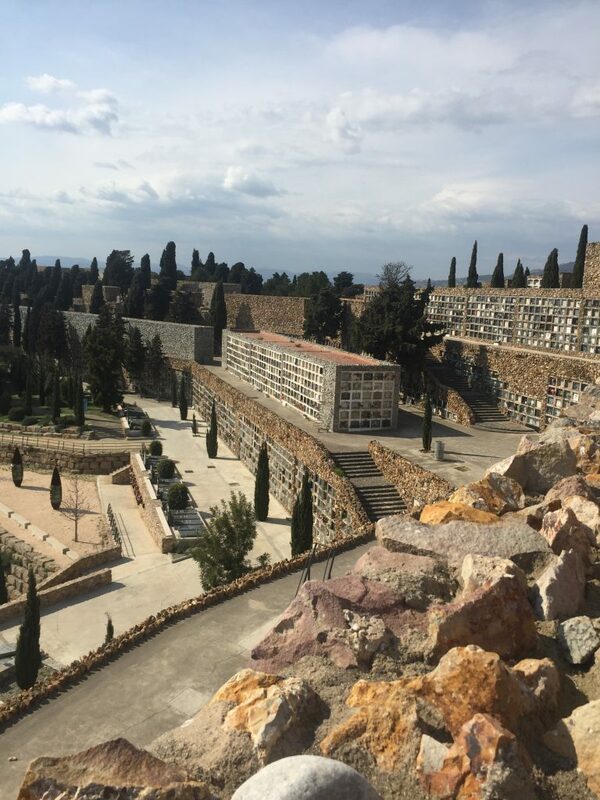 Once we got closer, however, we realized that what appeared to be apartments were actually the graves of Montjuïc Cemetary. You see, the graves here are stacked six high. We have never seen anything like it before. Not only were they stacked but the cemetery went on forever. 54 acres of graves! The rows of graves were maze-like and we had to swtich-back back and forth until we could get to the crest of the hill where we could see just how huge this cemetery really is. The graveyard was started in 1883 and is now said to contain the burials and cremations of over one million people in 154,000 graves. You see, each grave is a family grave. Families are buried together, hence there are no dates on the grave markers. Many of the graves had pictures of the people they contained as well as trinkets, stuffed animals, and glass statues. We did not stay long, nor did we find those statues I was looking for, but it was incredibly interesting to see and a healthy reminder of our own mortality.